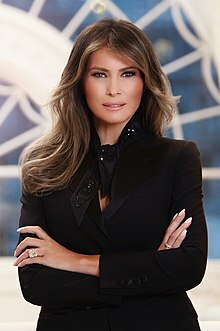 Melania Trump (born Melanija Knavs;[lower-alpha 1] Aprile 26, 1970; an aa kent as Melania Knauss) is a Slovene American umwhile model wha is mairit tae American businessman an 45t Preses o the Unitit States, Donald Trump. ↑ Trebay, Guy (September 30, 2015). "Melania Trump, the Silent Partner". Fashion & Style. The New York Times. Archived frae the oreeginal on February 28, 2016. Retrieved September 1, 2016. ↑ Jordan, Mary (September 30, 2015). "Meet Melania Trump, a New Model for First Lady". The Washington Post. Retrieved October 1, 2015.